These posts entail 50% of the fulltime weekly hours, offering a contract of 3 years. Requirements: Very good or good university degree (Masters or equivalent), preferably in economics, agricultural, forestry or environmental sciences with a focus in ecological economics or environmental economics; familiarity with the ecosystem services concept. A background in the following areas is of advantage: environmental valuation and environmental-economic accounting (topic 1); public finance, economic analysis of environmental policy instruments and ecological fiscal transfers (topic 2); quantitative and qualitative methods in economics / social sciences (both topics). Very good English and German language and communication skills are also required. The posts also involve teaching in English language in the newly introduced MSc Programmes of "Ecosystem Services" and "Biodiversity and Collection Management". Closing date: January 9, 2017. The assessment of ecosystem’s condition requires information about drivers (land use, mmanagement), pressure (land-take, pollution, climate change) and their impact on the structure and function of the ecosystems. The main objective of this topic is to discuss about appropriate indicators for ecosystem condition, quantification of these indicators and spatial representation of the indicators data. Socio-cultural methods are related to analyzes of human preference, uncover of individual and collective values and perceptions towards ecosystem services in non monetary units. This topic addresses the problems and challenges in the application of socio-cultural methods for mapping and assessment purposes and their potential to derive indicators for ecosystem services supply, flow and demand. A special session at the event will look at threats and potentialities of urban and peri-urban ecosystems. Urban and peri-urban areas roost most of the world population. The high human pressure is amplifying the impacts of the natural hazards in these areas, including human lives and ecosystems sustainability. Urbanization changes the water cycle due soil imperviousness, and normally, increase the runoff and flood hazards. These events have to be managed and mitigated due to the destruction caused and due to problems related to water demand and pollution. Other important problem in urban areas is the increase of land degradation as a consequence of activities that constitute a threat to soil (e.g. construction works, residues deposition). Land degradation do not affect only the sustainability of the ecosystems but also the production capacity of the soil. This session aims to give an overview of the problems within urban and peri-urban areas, namely related with soil, water, vegetation and hazards, and to discuss the current and future management issues to the challenge of global changes. Contributions regarding to sustainable ways to improve water, nutrients and energy cycles within these areas and how to use the ecosystem services to mitigate impacts of future extreme events and hazards are also welcome. The Belgian community of practice on Ecosystem Services announces third edition of the BEES Market. This year’s host is the Natural Capital Platform of the Faculty of Bioscience Engineering at Ghent University and the market will take place on Tuesday 13th of December 2016 at Congrescentrum ‘Het Pand’ in Ghent. The BEES Xmas market brings together people from academia, public administration and civil society, from Belgium and abroad, with one common interest: ecosystem services. The BEES market is the perfect spot to exchange ideas, learn from other experiences and discover how ecosystem services are transformed into real products or daily life applications. The concept? A cozy afternoon in a friendly Xmas market-like atmosphere: the perfect event to wrap up 2016 in a useful and fun way! Exibitors can choose to have a stand, give a training session or just to enjoy the market. Register here before 20th of November. The Swedish Species Information Centre is a national center for species and habitats. The cetre contributes to a sustainable management of the natural resources by collecting, analyzing and making data available, and by describing andpresenting facts about biodiversity. The organization interacts nationally and internationally, with focus on the benefit for conservation. Now the Swedish Species Information Centre recruits two people who will model and simulate the distribution and (meta)population dynamics of species. Special Issue "Agro(Eco)System Services—Supply and Demand from Fields to Society" published in LAND. A new Special Issue (edited by Benjamin Burkhard, Stefan Hotes and Hubert Wiggering) of the online and fully open-access journal LAND deals with questions of ecosystem services delivery in managed and human-modified systems. Existing agricultural systems in different socio-ecological settings are analysed based on system-oriented modeling and simulation, experimental work, observations, interviews with experts, stakeholders and farmers, and analyses of agriculture and land use systems. Based on that, concepts for improved agricultural systems that aim to integrate the supply of/demand for multiple agro(eco)system services so as to maintain long-term ecosystem functioning are elaborated. All articles can be accessed from the journal website. Following the 8th ESP Conference last year in Stellenbosch, the new ESP-associated journal One Ecosystem is now ready to welcome your contributions to its first Special Issue "Ecosystem services – methods, data and applications". One Ecosystem is an innovative Open Access scholarly journal that welcomes, in addition to conventional research papers, contributions documenting the entire research cycle, including data, models, methods, workflows, results, software, perspectives and policy recommendations. Contributions from all ESP 8 sessions and ESP Working Groups are welcome! With this Special Issue (and the new Journal) the main intention is to really make a difference, by promoting and supporting methods and data sharing, ideas exchange and dissemination of relevant applications in the sphere of ecosystem services. For this reason, the focus of this Special Issue is kept broad, welcoming all contributions related to ecosystem service research methods, data and their applications in science, policy making, society and practice. Please contact one of the Special Issue editors in case you are unsecure whether your specific topic is fitting. Twi PhD positions for ecosystem services in coastal regions have been opened at Kiel University. Click on the links below to download the official offers and learn how to apply. 1 position for Economic Assesment. Application deadline: March 31, 2016. The University of Southampton is seeking to appoint two Research Fellows to work with Dr Felix Eigenbrod on his European Research Council Starting Grant, "Scaling Rules for Ecosystem Service Mapping (SCALEFORES)" in the School of Geography and the Environment. Qualified applicants are encouraged to apply for both positions. The deadline for application for both positions is 1 April 2016. Biodiversity decline is a fact, but how can society be convinced of the benefits of biodiversity for human well being and of the necessity of further protective action? The FP7 funded EU project Biodiversity and Ecosystem Services: Arguments for our Future Environment (BESAFE) addressed this challenge to produce guidance that can help improve the way we use arguments for conservation and convincingly demonstrate the value of biodiversity to decision-makers. Two key outputs of the project are the final brochure "How to Argue for Biodiversity Conservation More Effectively: Recommendations from the BESAFE project", including key conclusions from project publications and case studies, and an interactive online tool, which can lead stakeholders to the relevant information in a few mouse clicks. - The success of a more integrated approach depends on stakeholder engagement. A top-down policy framework that sets goals for the protection of particular sites and species is important, but it is not enough to prevent biodiversity loss. - -- An integrated approach, seeking to 'mainstream' biodiversity concerns across all policy sectors (e.g. agriculture, forestry, water, energy, transport and urban planning) is needed. - Promote bottom-up initiatives at the local level. All stakeholders need to be actively involved in the decision-making process, which should facilitate building trust and working towards generally agreed and accepted solutions. - Tailor arguments to the audience. Arguments need to be framed to fit the values and goals of the audience, embracing the plurality of values attached to nature, and using appropriate language. For example, over-emphasising economic arguments could alienate people who are motivated mainly by ethical and moral concerns. - Use positive arguments. Positive framing of arguments to emphasise benefits is often more powerful than negative framing that focuses on threats and losses. The concept of ecosystem services is useful for emphasising positive benefits, provided that it is properly explained to stakeholders. - Use a wider range of arguments. Arguments based on the economic value of nature for humans dominate European and national policy-making, and are often seen as central to gaining high-level policy-maker support, but our results show that many decision-makers and other stakeholders also use and respond positively to ethical and moral arguments. "We aimed to provide the essence of 4 years worth of research in an easy to read and reuse form, to maximise the potential of using the right arguments for conservation at the right time in order to successfully demonstrate the value of biodiversity to decision-makers," comments Rob Bugter, co-ordinator of the BESAFE project. We depend on healthy and resilient ecosystems to continue to deliver services, such as food, water, clean air and stable climate, which are essential for our well-being. A new EEA report provides an overview about the current condition of ecosystems in Europe and the human pressures they are exposed to. 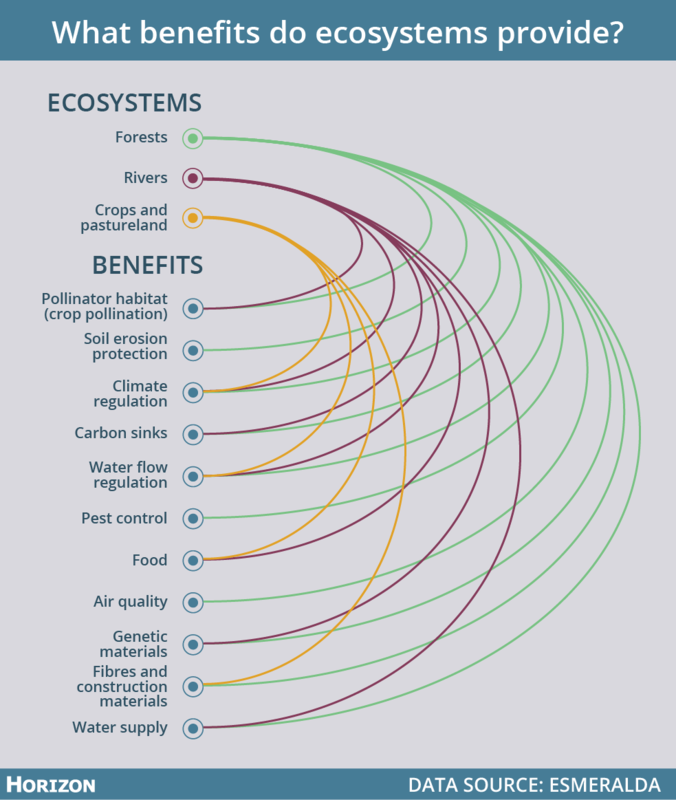 An ecosystem map for Europe reveals that many ecosystems are highly concentrated in a small number of countries, which could increase their vulnerability to environmental change, and a substantial proportion of the most vulnerable ecosystems are not protected within Natura 2000 sites, Marine Protected Areas or equivalent zones. Download the report on the EEA dedicated page. "We need better incentives for scientists who want to share their data. One Ecosystem provides such incentives by linking peer review to open data" adds Joachim Maes, European Commission - Joint Research Centre. "We believe that open access to all the relevant products of the scientific cycle is key to both scientific advancement, and innovation in the real world. With One Ecosystem we aim at fostering open exchange of information to address sustainability challenges." - Deputy Editor-in-Chief Dr. Davide Geneletti, University of Trento. "With One Ecosystem we want to accelerate scientific progress in the frontier research fields of ecology and sustainability. We are convinced that this new format of writing, reviewing and open access publishing of scientific findings is the future", explains the Editor-in Chief of One Ecosystem - Dr. Benjamin Burkhard, University of Kiel. The Institute of Environmental Planning at Leibniz Universität Hanover, contingent upon approval from the funding institution, invites applications for four PhD positions in Landscape Planning and GIS, Landscape Ecology, Social Sciences, and Economics.